Someday I’d like to add a router to our home network to make it easier to do things without having to mess around with Windows Internet Connection Sharing. 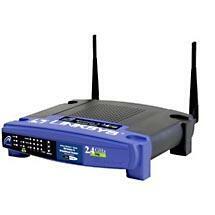 This lynksys Wireless-G router looks like it’s just perfect for the job. That, along with a few lengths of 10/100 Ethernet cable would go along way to improve things. Plus, with it’s wireless capability, it’s ready for the eventual purchase of a Laptop with a Wireless Lan card.